A little white lie never hurt anyone, right? From that "doctor's appointment" to checking Facebook when you should be working, employees disguise a number of deceptions from 9 to 5. A little white lie never hurt anyone, right? 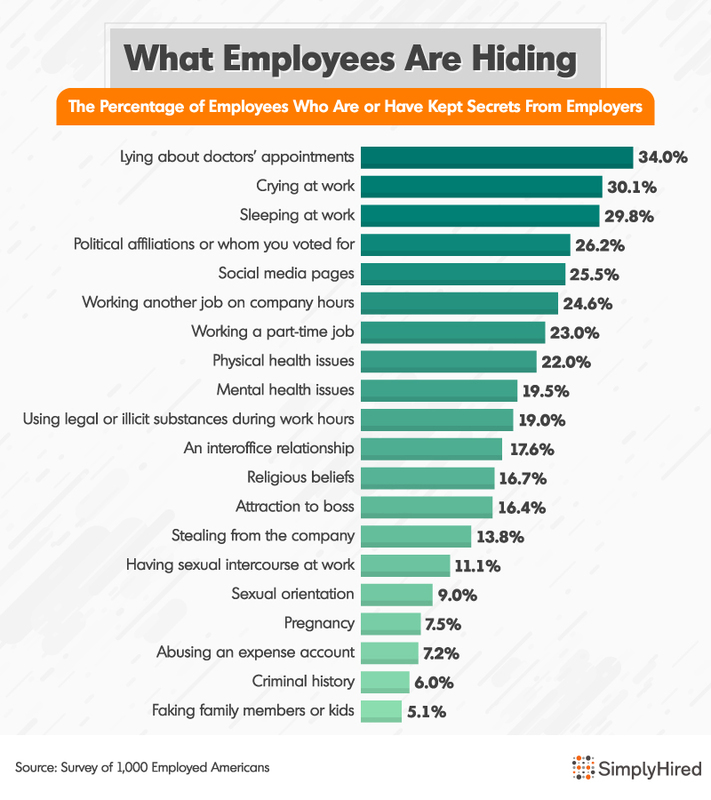 From that "doctor&apos;s appointment" to checking Facebook when you should be working, employees disguise a number of deceptions from 9 to 5. SimplyHired polled 1,000 employed Americans about what they keep hidden from their bosses, what lies they&apos;ve heard coworkers tell and which offenses they feel most guilty about. Popular half-truths included whether they had ever cried at work, fallen asleep at their desk, had an interoffice relationship or picked up a side job on the sly.